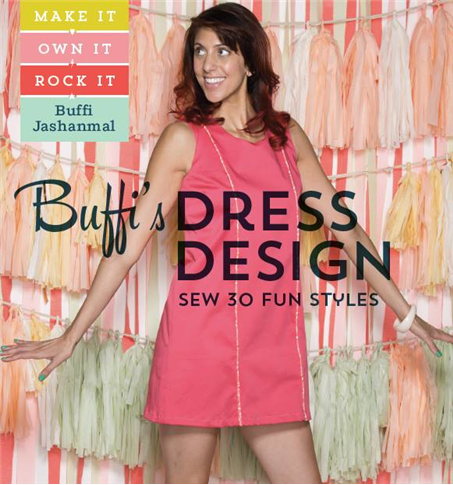 If you like to sew, and are ready to take it to the next level and start making your own patterns, this is a great book. The author assumes that you know the very basics of sewing, how to thread your machine, and do straight and zig zag stitches. If you don't, that information will be in your owner's manual. After that, she teaches you from the ground up. She explains how to get your fabric on grain, how to finish seams nicely, what slopers are, how to take proper measurements and customize one to fit, and how they are used in pattern creation. She takes you step by step through all the processes in a nice, organized way that's easy to read with lots of pictures. The introduction also talks about body types and gives suggestions from projects in the book for the best silhouettes to flatter those types. Three basic slopers are included for 3 dress styles- sheath, shift and princess seamed. A shift fits loosely, and is more fitted to the shoulders and bust than to the waist and hips, a sheath is fitted more closely, princess seams are the dresses with 2 fitted seams in the front for a very nice and very feminine fit. Each dress style has 3 variations in the projects. The author explains how to create the patterns using the slopers you made to fit you just perfectly. A lot of the dresses maybe on the short side for some people, but lengthening is fairly simple, just remember to buy more yardage than recommended if you are lengthening the dress. The styles have a wonderful range, there are very tailored pieces and dresses that are more flowing and softer. All the instructions with the diagrams are clear and understandable. For techniques you may not have used before like applying interfacings- there are instructions in the book. The last chapter is designs made from thrifted clothing, remaking the old into something new. It's got some great ideas for that formal dress you found at a thrift store that had a fabulous retro fabric and not so fabulous lines, or even turning a couple pairs of jeans into a very cute dress for summer. One of my favorite things about this book is that dress styles themselves are classic. They take a note from the past and you can see the influence of other decades in the lines. They are made from more contemporary colors and trimmings, but the fact that a wrap dress is just as wearable now as it was in the 80s, or a shift with lines that wouldn't have looked out of place in the 60s would be cute at a party today proves the timelessness of the designs. Absolutely recommended, and it's going up on my shelf with my vintage Vogue sewing books and other favorite references for sewing. Check out Storey Publishing on FB for giveaways, ideas, recipes and projects!